I cannot believe that, as of yet, I have not written a post entitled “If You Are Not a Part of the Solution, You Are a Part of the Problem”. I am SUCH a subscriber to that ideology because it is a simple truth. While being a part of a solution may not completely fix a problem, doing nothing to resolve a problem allows it to continue full force. This ideology is what prompted me to start this blog. I realized that because I did not understand what Mental Illness was, how it affected me, how it affected the people around me, or why there is so little first-person sharing of MI, I decided to be a part of the solution. Through my blog, I have been able to better understand MI’s role in my life, how it affects me, how it affects the people around me, and (hopefully) help others who go through similar difficulties and help them feel less alone. Okay, okay…so what is my point? Point is, I want to help you connect with organizations, government representatives, and others who you can work with, and through, to be a part of the solution to issues that exist in your world. Want LESS gun control? Contact your Representative and Senators! Want MORE gun control? Contact your Representative and Senators! LGBT concerns? Contact your Representative and Senators! WANT MENTAL HEALTH IN THE FOREFRONT OF CONGRESS’ COLLECTIVE MIND? (Hint, hint!) Contact your Representative and Senators! This may have to be a work in progress, but I’ll at least get it going in a basic form. 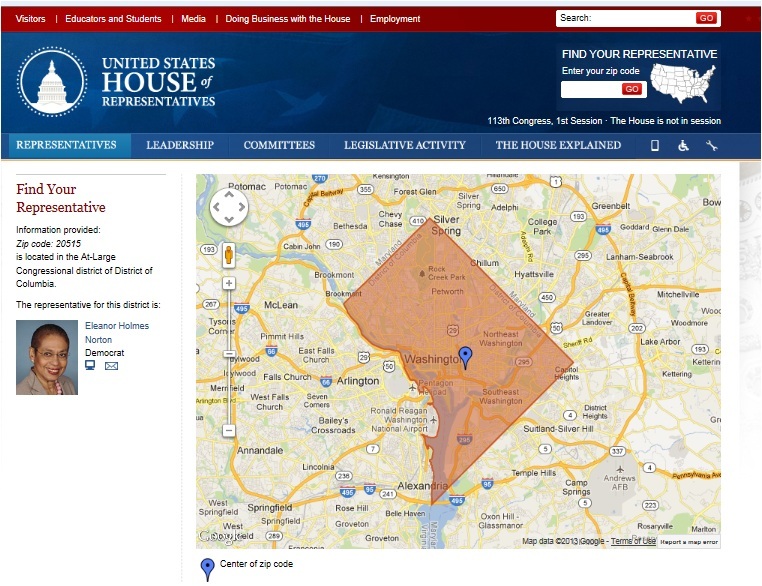 To find your Representative in the United States House of Representatives, click the picture below. There you will be able to enter your 5 digit ZIP code as show below (I used Washington, D.C.’s ZIP code as an example). 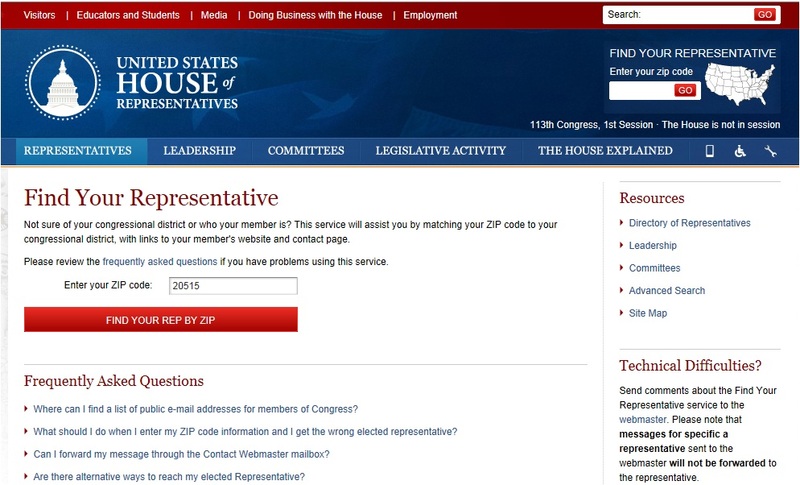 All you need to do now is click on your Representative’s link. 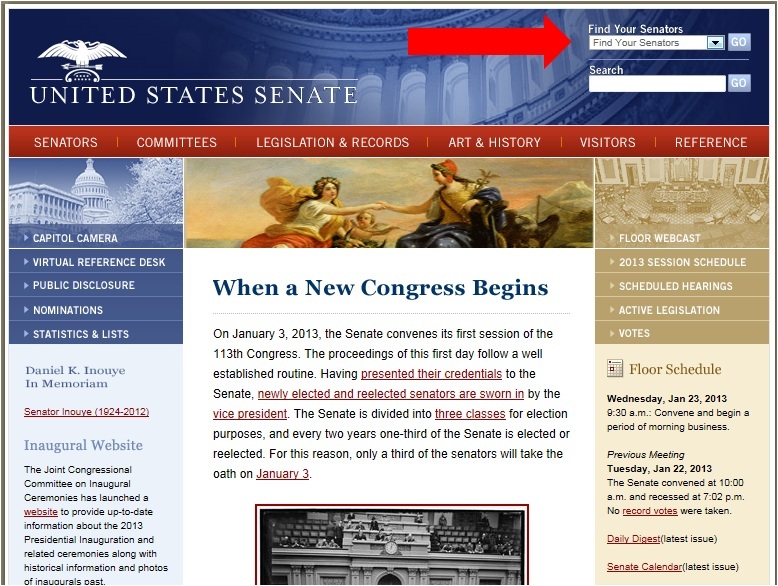 You can click your Representative’s name or the computer screen to go directly to their office website or click on the envelope to go directly to their contact page. Easy peasy! Now, on to contacting your Senator! To find your Senators, in the United States House of Representatives, click the picture below. At this point, you can search for your Senator by State, Senator’s name, or Senator’s class, which again, I pointed out with three big, red arrows. Now you can simply choose from the drop-down menus. Using Virginia’s Senators as my example this time, you will find information on your Senator, State, or Senator’s class of your choice, as below. 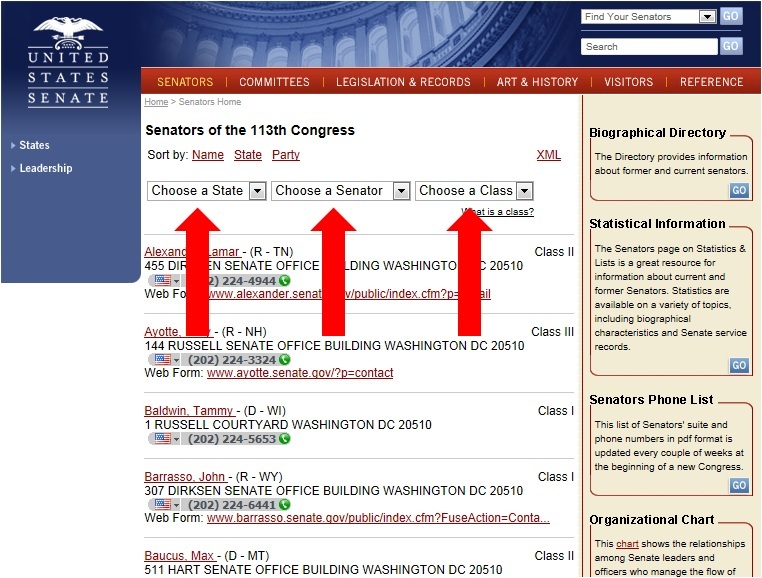 Here, you can click on your Senator’s name to go directly to their office website, find their office phone number, or click on the “Web Form” link to go directly to a contact page for that Senator. Once again…easy peasy. I will provide some tips for addressing your representative of choice in a future update! This entry was tagged Congress, DC, House of Representatives, Senate, US Congress, Washington. Bookmark the permalink.